A high-speed San Francisco Bay Ferry leaves the Embarcadero waterfront to link the City with Oakland on the eastern shore of San Francisco Bay. 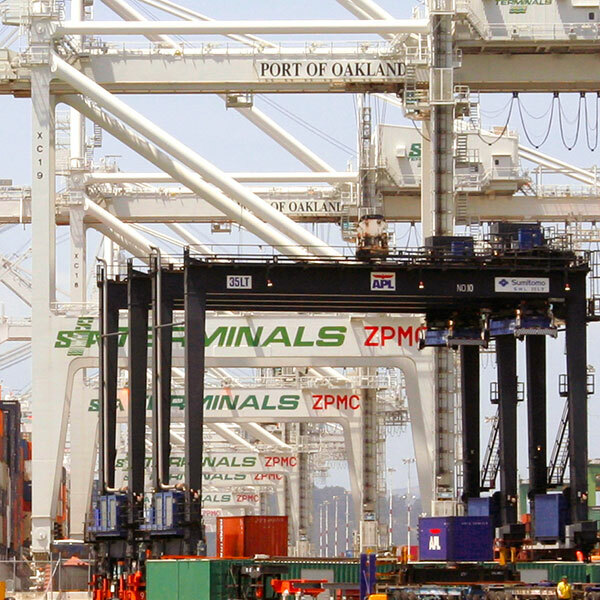 It skims across open water under the silvery grey steelwork of the Bay Bridge to enter the long and narrow Oakland Harbour dominated by the Oakland International Container Terminal. 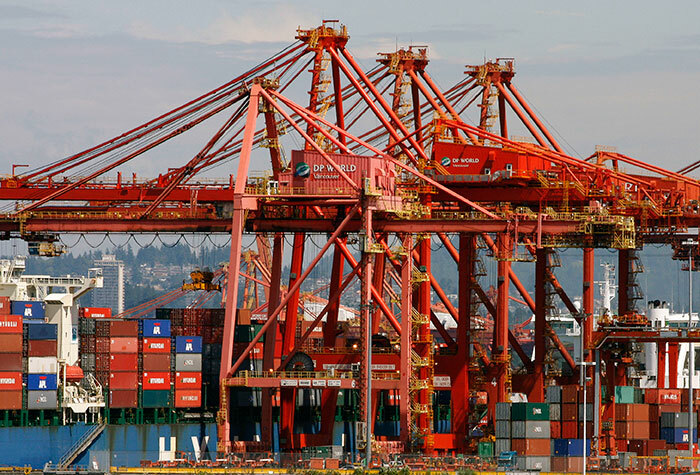 The gigantic ships, the high stacks of brightly coloured containers and the white gantry cranes are visually dramatic. 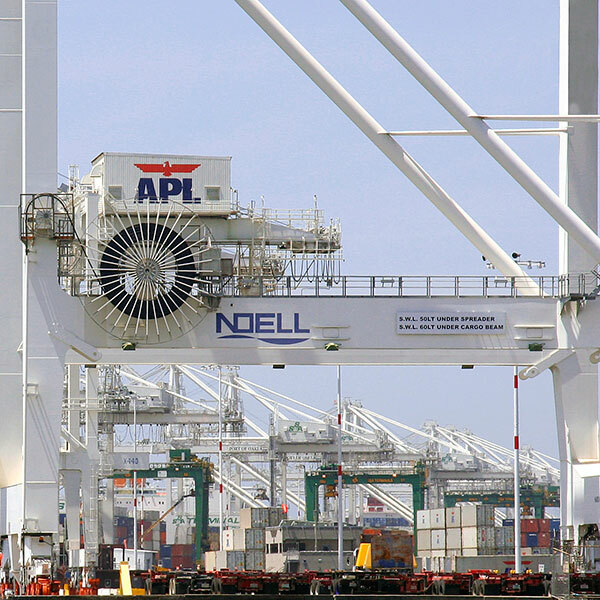 Transport of all manner of goods by intermodal container on ship, truck and train is a familiar sight. The vessels are impressive enough as they sail in from the Pacific and under the Golden Gate and Bay Bridges but almost overwhelmingly so from a few yards of the moving ferry: its destination pier was ideal for shots looking along the length of the Terminal. (See also BOATS &amp; SHIPS 09 and 10). The method has a history from the canal system developed in the United Kingdom across the eighteenth century. Railways in Britain developed their own versions to the point where liner trains of containers were a common sight until modernisation from the 1960s saw their gradual demise and rebirth. Smaller in size and ubiquity than those we now take for granted they didn't require gantry cranes on the epic scale recorded here. 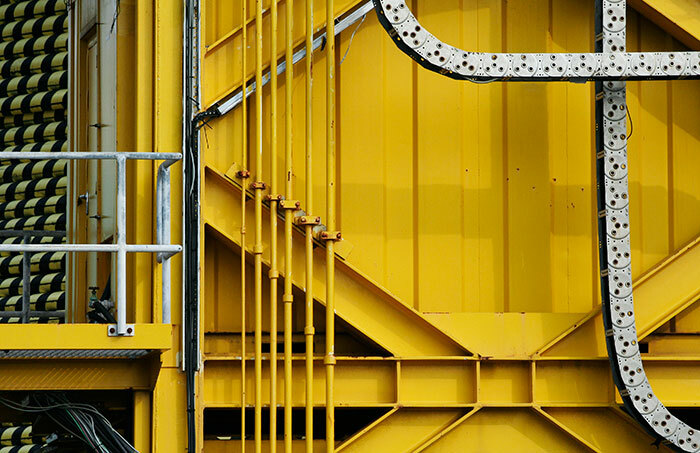 The prototypes of present-day steel containers were created by Malcom McLean in the 1950s to improve the efficiency of his long established freight trucking business in the USA. His first use of a converted cargo ship to carry his containers and their use on railroads validated the whole modernised concept. Image 18 in this set is a shot of the bright red gantry cranes on the Vancouver container dock. The Tyne Bridge in Newcastle was designed by Mott, Hay & Anderson, built by Dorman Long & Co of Middlesbrough (who built the similar but much larger Sidney Harbour Bridge) and opened in 1928. 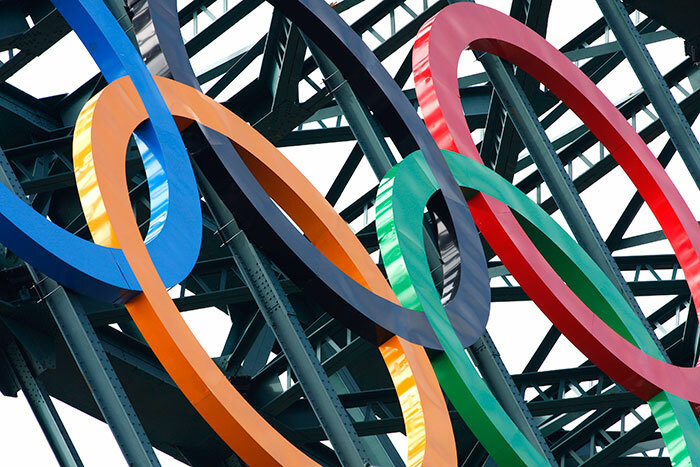 Britain hosted the Olympic Games in 2012 and its five-ring symbol was attached to the bridge to celebrate the City's active role as a soccer venue. A three-dimensional structure, it measured some eighty-two by forty feet. On a visit to the Edinburgh International Festival a few years ago I passed this building site whilst walking in the city. Then, I was more concerned with the pictorial composition of line, shape, pattern, colour etc. than the structure itself. Photographing it now I would explore its possibilities more widely. For a century and a half and more the industrial age shipyards on the River Tyne built for governments and shipping companies worldwide. Obsolete machinery, outdated working practices and lack of investment inevitably led to competitive decline and closure. By the end of the twentieth century only ship repair capacity remained. These two images were made at the site of the Walker Naval Yard on the river. 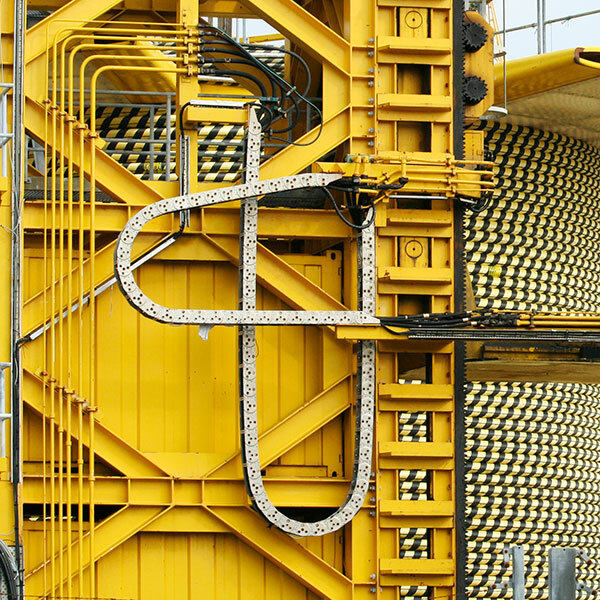 They show details from a large outdoor facility that winds undersea cables on to huge drums that in turn are loaded on to ships for transport to their ocean location. Look at the RIVER TYNE WALKS (01>05) and the NORMAND SEVEN galleries for images of the yard and a related cable laying ship. The bright toy-yellow paint scheme appealed. 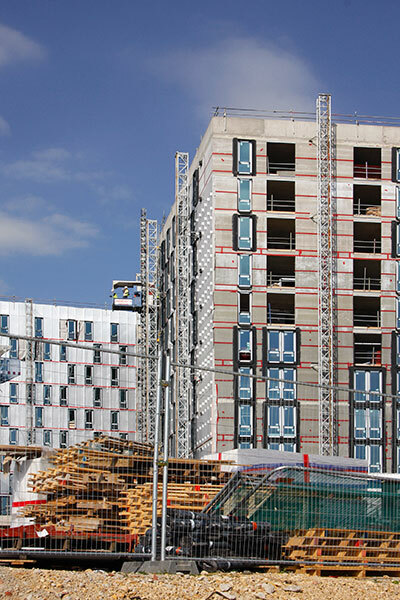 Northumbria University has maintained an ambitious building programme in recent times. 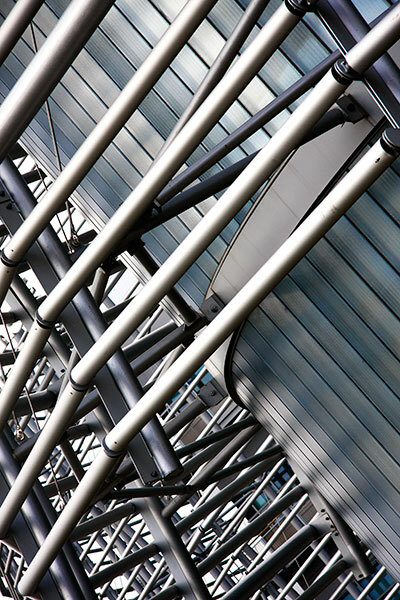 This is a small detail from a curvaceous building completed in 2007 to house the Schools of Design, Law and Business. It has a fascinating mix of materials and forms whether walking through or taking a wider view of the exterior enabled by its island site. 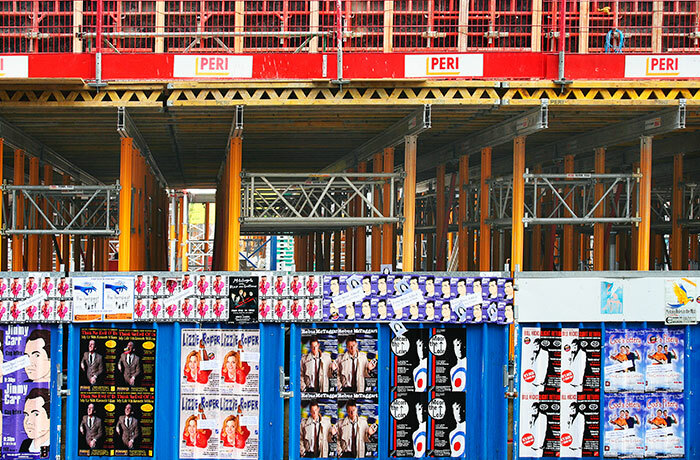 These three photographs made in 2011 record part of a re-development of an extensive former industrial site to provide academic, administrative and student accommodation for the Newcastle University. 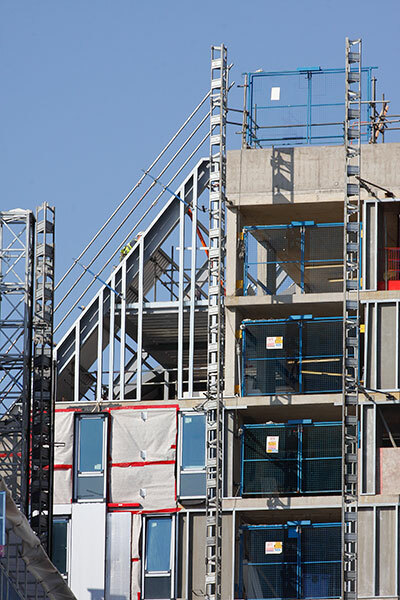 My interest lay in the forms that would be hidden by the final exterior cladding and the temporary support structures and materials used by the builders. Over many years I've watched the developments in materials and structural techniques in architecture. The NEWCASTLE CITY LIBRARY gallery records the demise of a typically massive 1960s steel reinforced concrete building to clear the site for a very different replacement. 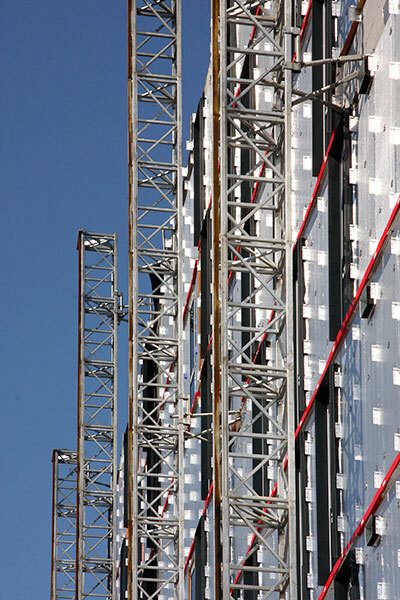 Its tall steel beam frame encloses a light-filled space and supports a glass and metal panelled exterior skin. It seems that I deliberately use diagonals of one form or another in compositions. Here, it was the rectangular grid interrupted by the diagonal framing that guided its appearance in this one. 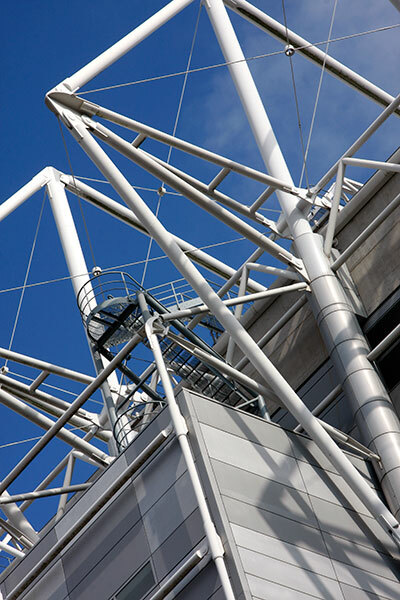 Whilst making the previous trio of photographs I was working next to the St James' Park Stadium, home to Newcastle United Football Club. I had photographed there twice in earlier years but as the light was good I briefly wielded the camera again. A mix of those earlier colour and monochrome images appears in the ST. JAMES' PARK STADIUM gallery. 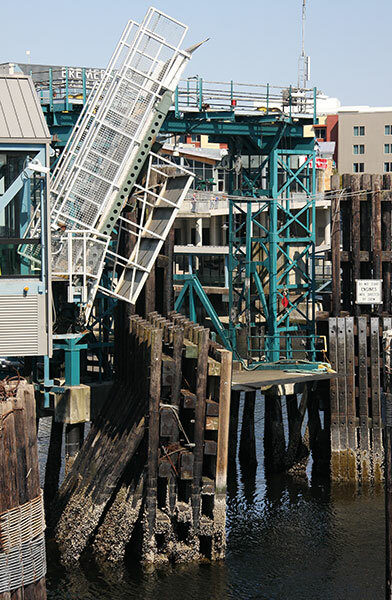 This image is from walks in the harbour and industrial area south of Seattle city centre. Rail yards, container docks, industry, the Boeing Renton aircraft plant, Seattle Museum of Flight, sports stadia, empty lots, cafes, retail stores and more can be seen. 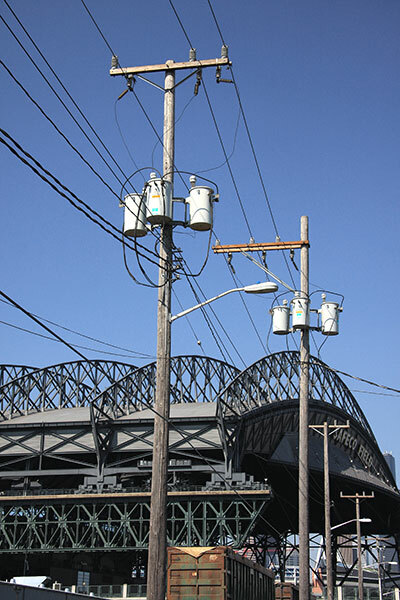 Here, the moveable roof structure of the Safeco Field stadium and overhead cable lines stand in contrast. The Washington State Ferries service from Seattle to Bremerton docks at this terminal next to the town's US Navy shipyard. The Puget Sound Navy Museum overlooks new and imaginatively designed gardens created between them. In the last decade or so the town has seen much new building and the restoration of some fine earlier structures such as the art deco Admiral Theatre. The Wallsend shipyard of Swan, Hunter & Wigham Richardson on the River Tyne had a long and illustrious history. It's best known ship must be the revolutionary steam turbine powered RMS Mauretania launched for the Cunard Line in 1906. From shortly after her maiden voyage in 1907 she held the Blue Riband as the fastest transatlantic liner until 1928. In 2008 the yard was in the advanced stages of demolition. 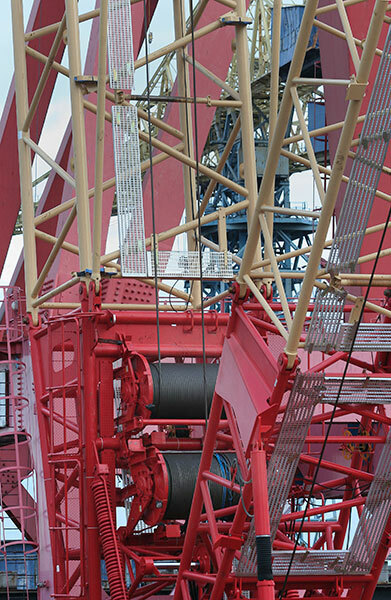 A gigantic mobile crane used in the work stands in front of two of its victims. 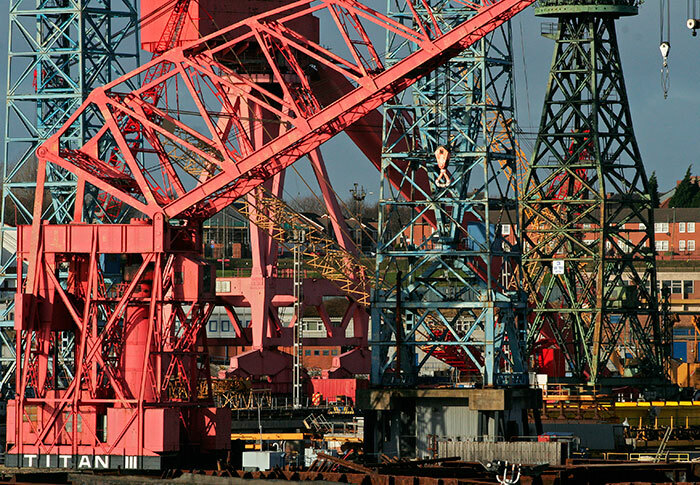 A decline from the 1980s led to yard closure and, in 2007, the sale of machinery and cranes to the Bharati Shipyard in India. In its final years I spent time on recording the dismantling or demolition of cranes and buildings: a gallery of selected images will eventually be added. My involvement with photography came too late to record the good times when ships were routinely built and launched. The late afternoon January sun softened the bleakness of the scene. A walk on the central south shore of Vancouver Harbour passed seaplane, cruise ship and container ship docks. Photographs of seaplanes are in the VANCOUVER FLOATPLANES gallery. 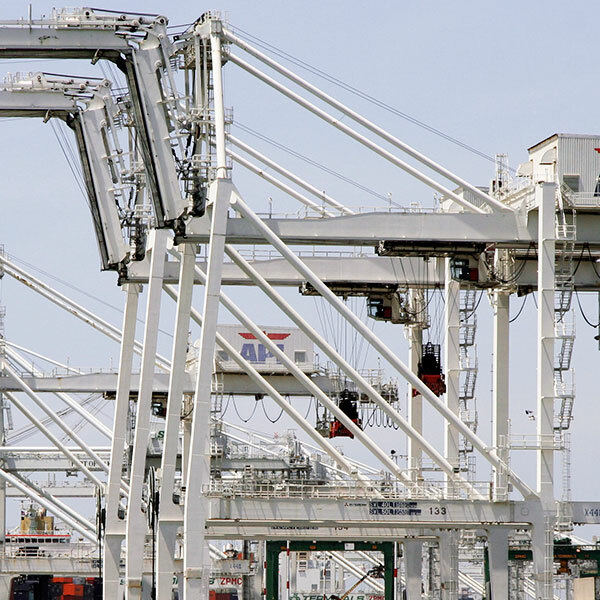 I was disappointed not to have more time to spend on finding closer viewpoints to add to this shot of the gantry cranes on the container dock. A rather different interpretation appears as Image 16 in the REFLECTIONS IN ARCHITECTURE gallery.